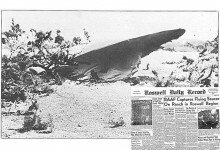 Roswell USA has been the reported crash site of six unidentified flying objects, but what was deemed by many to be the crash site of UFOs was the fact that immediately after the incident, 2 Air Force officers were sent to the site for investigation. What was found there was not made public. The incident remains to this day one of the most publicly notorious UFO based stories and the fact that it has been kept under wraps for such a long period furthermore gave fuel to the public for such a prolonged period of time. The incident took place in 1947 and it is one of the first incidents that, aided by the mainstream TV broadcasts, by the general public distrust in authorities and by many inconsistent reports over the time, it has given rise to the sprawling UFO pop culture phenomenon. Just before this massive UFO incident took place, 2 weeks before it, another less massive incident was reported in Washington State. Two people were killed as well and there was still physical evidence of materials that were reported as being non human made in the wreckage. Materials and debris was found under water and in the crash sites. Whether the people were killed to keep the incident under wraps or it was the aliens trying to reduce the traces of the first encounter that might have took place. In terms of physical evidence a number of objects were found that could not be explained as to how they materialized. It was a few discs made out of a composite of stone with some metal contents inside, metals that were not identifiable at the moment when the crashes were investigated. The search for evidence and for corroborating the results continues, but one fact remains certain – 4 people were killed or died mysteriously just because they happened to be linked to the incidents.